Attribuzione: J. v. Schley, direx. Formato: 1 map : Kupferstich ; 21 x 21 cm. 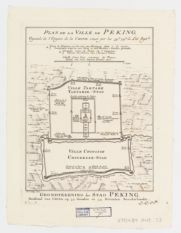 Note: Shows "Ville Tartare" including palace and "Ville Chinoise" with temples and Jesuit buildings, churches, schools and cemetary.Appears in: Histoire générale des voyages / Antoine-Francois Prevost. Hague: Pierre de Hondt, 1747-1767. v. 7, p. 39Available also as a digital image through the Harvard University Web site. In French and Dutch.